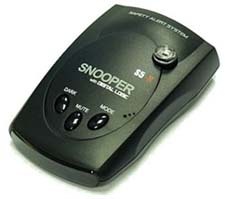 The Snooper S5r is a true speed camera detector for your car. That is to say it listens for the signals that speed cameras and guns emit, laser or radar, then bleeps to warn you of the danger. The advantage of this type of device is that it well warn you of mobile laser traps and fixed position radar cameras, but it won't warn you of the new cameras like truvelo or specs, because they emit no radiation, relying on sensors in the road or number plate recognition respectively. So this type of Speed Camera Detector is best used as a supplement to a GPS based system, for the driver who wants the extra security of knowing they've got a good chance of detecting most mobile units. This is especially true as the police are starting to use mini gatsos for temporary or mobile speed traps. This is because the accuracy of a laser gun can easily be challenged in court, they need a skilled operator, whereas the radar based gatso can be used accurately with little training or experience. Why does that matter? Well, the more expensive Speed Camera detectors from Snooper and Road Angel have built in laser detection as well as GPS maps, but no radar detection, so they will not warn you if a radar based gun is pointing at you! There was talk of the government banning this type of device, as it would know which cameras were turned off, but as yet no legislation has gone through parliament, so they're still a good buy, and used in conjunction with a GPS system, you'll pick up .most safety and speed traps. In use, the Snooper S5 works very well, scanning all common Radar and Laser frequencies. It warning me within a couple of seconds when approaching a couple of Gatsos, and I was lucky enough to drive past a Safety Van while the laser was turned on, and the unit picked this up too. Because of the predominance of Truvelos (which use a sensor in the road) is was unable to complete a full test & review, but I am confident that the Snooper S5r is a well-made competent unit, but I would only use it in conjunction with a GPS based Speed Camera Detector device.